Civil War chevrons were large and worn with the points downward. This one measures 20.5 by 17 centimeters. The Regulations do not state a specific size. They were intended to make noncommissioned officers stand out to their men on the smokey black powder battlefield. 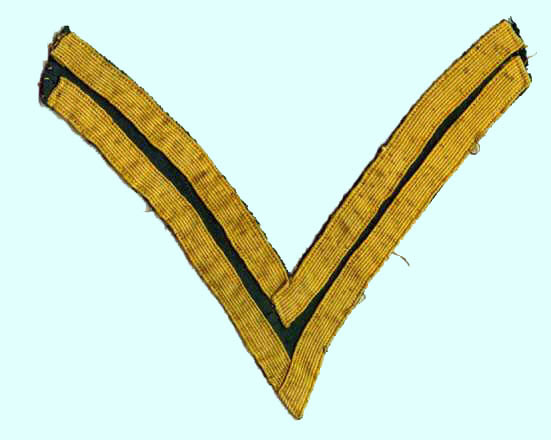 By the time of the Spanish-American war it was decided that chevrons were too conspicuous and in 1902 smaller chevrons were adopted, worn points upward. Members of the Signal Corps also wore yellow chevrons but in 1864 crossed signal flags were placed in the angle of the chevron. There were, however, no corporals authorized for the signal corps by a quirk of the Act of Congress authorizing the corps. The Corps of Engineers also wore yellow chevrons.